Friends, have you thought about why you like to entertain a certain way, and not another? Today I’m sharing a super fun, Cheeseburger Dill Pickle Soup Recipe, for easy causal hosting! Dill Pickle soup recipes have been around for a long time. There are Polish Dill Pickle soup recipes and and creamy base recipes. Today we’re add the “ground beef and cheese” to make a Cheeseburger style! How do you make dill pickle soup? Cook macaroni according to package directions. (Undercook the pasta 1-2 minutes, el dente). Garnish with shredded cheese, sour cream, and diced pickles. My hosting style has changed over the years, and now in our new cozy mountain home, I’m loving a more casual style of entertaining. 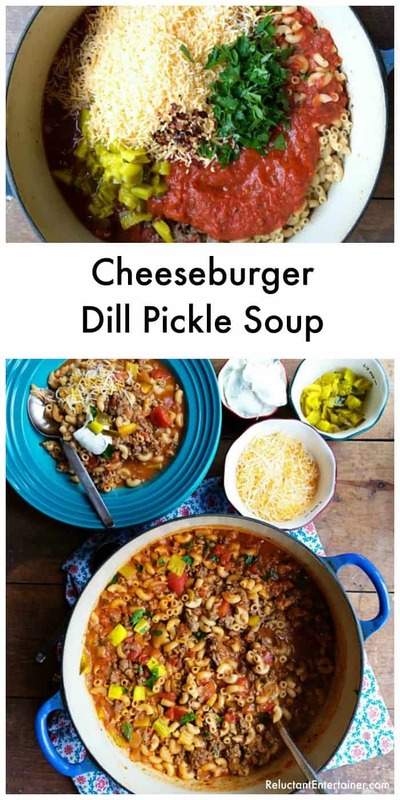 Like serving this Cheeseburger Dill Pickle Soup Recipe–super easy! When I think of the 4 personality types, the hospitality environment is different for all of us. Florence Littauer was the author of many books that I read on the personality types years ago. Now it’s all about the Enneagram, with 9 personalities! Today I’m summing up hosting with just 4! You’re sensitive to how things turn out–flavor of food, décor, if people enjoyed themselves–and you have a tendency to over-personalize the outcome, if there is a problem. This person definitely has a sense of being in charge, from beginning to end. Being a visionary, you can see (and do) the entire party by yourself. You’re driven by excellence! But you’re not opposed to delegating (handing off chores), and can even be a bit bossy. You are a person who has very high standards, and might even be a bit competitive when it comes to activities (games, conversation), and even the people you hang out with (welcoming guests who are similar in taste, background, outlook). This hostess is very pleasant, everyone loves you, and you have a ton of friends who enjoy your company. Being an introvert, you may be less organized and prepared for the event, and feel a little frazzled when company arrives. Let’s just say, you’re a last-minute planner. You love sitting around the table, engaging in good conversation, but would panic if there was any discomfort or controversial subjects discussed. Guest’s may get up to do the dishes, which you’re okay with. You do not always have to be in charge! You are super bouncy, fun, and friendly to everyone. No one is a stranger. In fact, come one, come all. The more the merrier! You’re very creative with ideas, meals, décor, games, discussion points. You see everyone’s needs and jump in to help, being sensitive to each person, and engaging with the quieter ones during the meal. (You’re an excellent conversationalist:) Now you can be a bit scattered, when throwing a party together (bad time management), but you are impulsive and adventurous with your ideas. 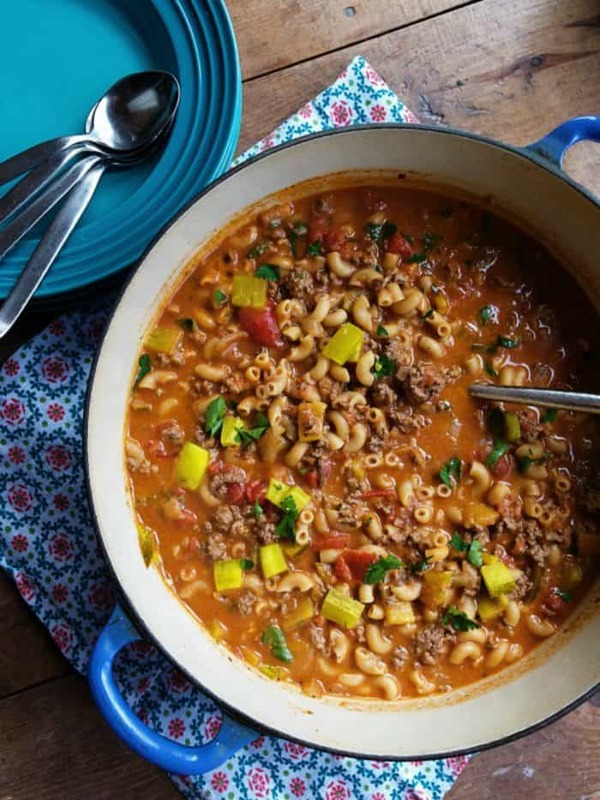 If you are planning a casual dinner anytime soon, hosting a soup night is super easy. 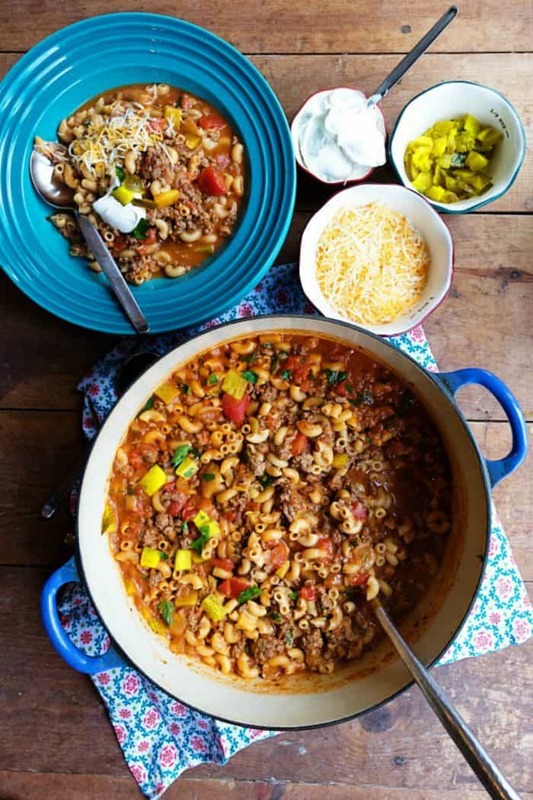 You make one pot of soup, serve bread and drinks – BAM! 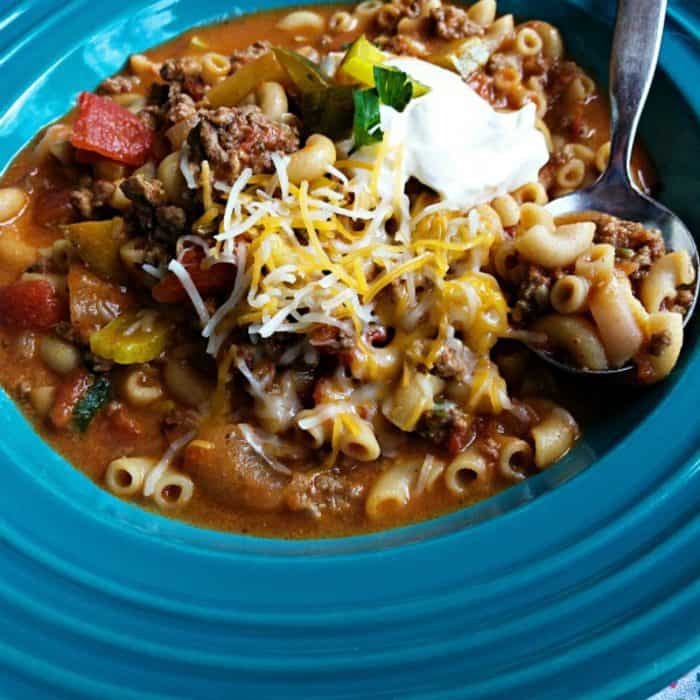 We love Cheeseburger Dill Pickle Soup Recipe! Dill pickles? Why, yes. My friend, Cathy, at Noble Pig, has a creamy dill pickle soup recipe, and also a dill pickle butter (what?? yum!) 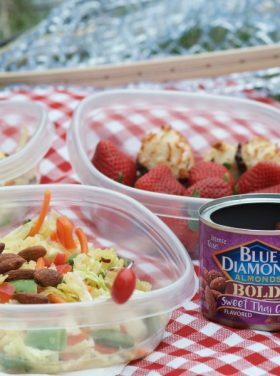 We also love my Golden Rice Salad, made with dill pickles (sort of like potato salad! ), and speaking of potato salad, you’ll have to try my Best Potato Salad (with bread and butter pickles, but you can certainly use dill pickles). 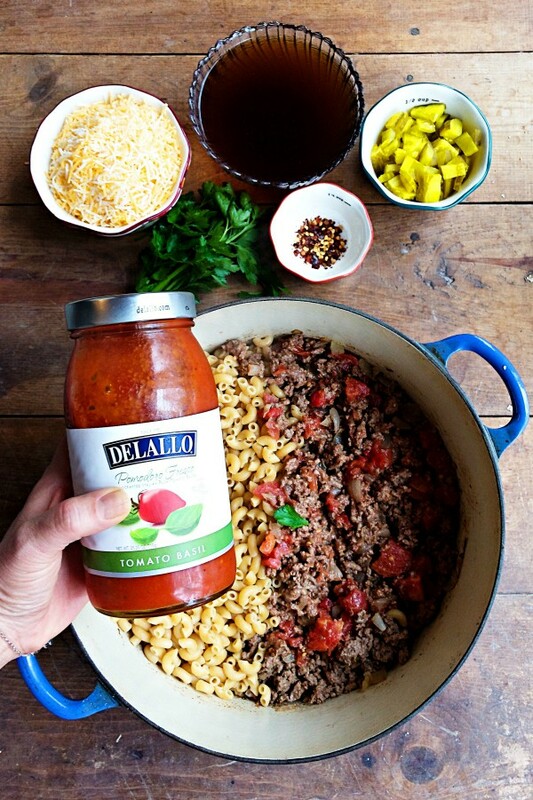 This recipe is made with DeLallo Food’s Elbows pasta and Tomato Basil Pomodoro Fresco sauce, it’s a hearty soup that tastes just like a cheeseburger! 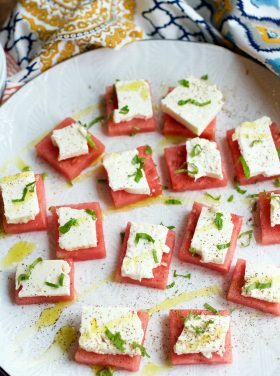 Serve it with your favorite toppings! Soup Night is a great way to make your guests feel welcome and relaxed. Time to get a date on the calendar and make that invite! In a large frying pan over medium heat, add ground beef. Break apart beef and cook until browned. 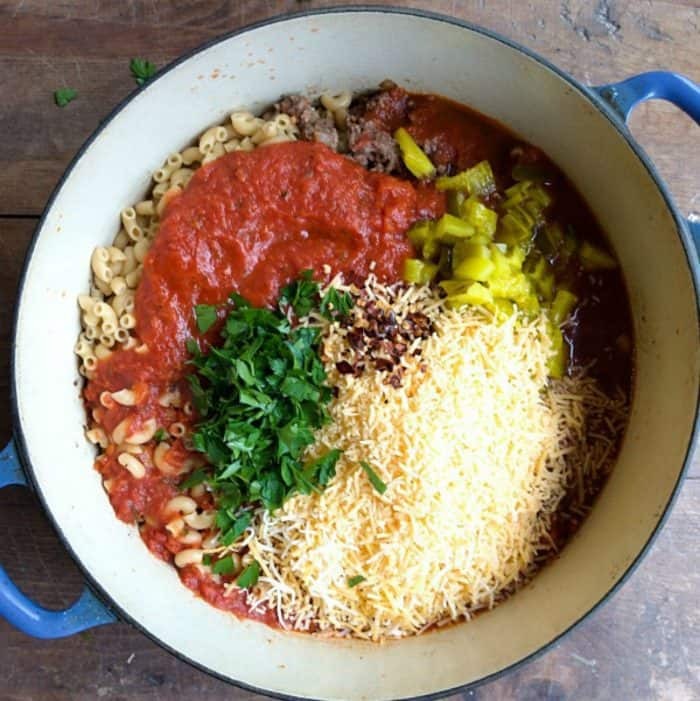 Use a slotted spoon to transfer ground beef to a bowl or plate; cover and set aside. Add olive oil to pan. Add the diced onion; cook, stirring occasionally, for 3-4 minutes. Add garlic, salt and pepper; continue to cook, stirring constantly, for 1 minute. Add dried parsley, yellow mustard, and red pepper flakes; stir. Boil a large pot of water; cook macaroni according to package directions. (Undercook the pasta 1-2 minutes, el dente); drain. 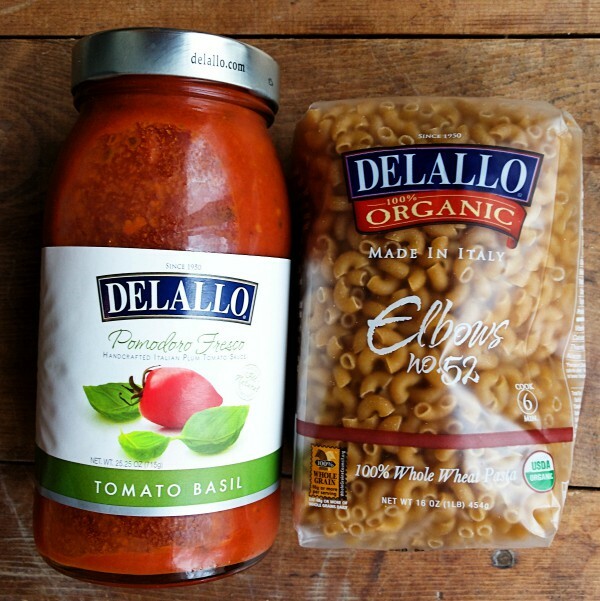 This post is sponsored by DeLallo Foods, which I love cooking with their products; but as always, all opinions are my own. Wonderful and that was after making some meatless Monday alterations: TVP rather than ground beef & vegetable broth rather than beef, and no cheese (until the end). Did not boil the macaroni separately, since I was going for more of a goulash texture, and it was a good call. Cheese was sprinkled on after plating, so that the vegan in the house could be accommodated :) First words I heard: “This tastes like a cheeseburger!”. Winner! Winner! Cheeseburger dinner! I’m wondering how many calories? Even though I was a little hesitant I took the leap and made this soup last night. (I thought the dill pickles sounded odd but intriguing?). I never know how my husband will react to new ideas but guess what ….he loved it! I will definitely make this again. Oh, one word of caution…I misread the ingredients and thought it said to add a 16 oz. jar of dill pickles instead of 1. 6 oz. jar. I went back and fished out a good many of the pickles from the soup. Not a big mistake but just wanted to keep others from making the same mistake I made. Thanks for a new recipe to add to my list. This soup was SO good! I will definitely be making this again! I made it while we were hunkered down in the middle of a blizzard that left 2′ of snow on the ground. It was the perfect comfort food! 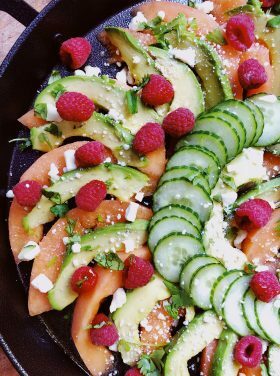 I did end up omitting the red pepper flakes because the instructions didn’t include it, though the ingredients list did – it was perfect without it. Thank you for a new favorite soup! Thanks Dianna! I added that into the instructions. Stay warm! Yum! This soup has my name written all over it. But I think I’ll cut it in half. That’s a lot of soup!